We are a community of men who gather monthly in our circle to sound our drums, raise our voices in song and speak from the wisdom of our personal experience. Centered in the tradition of storytelling, we explore and express our own masculine spirit and the deeper truths. We honor each other and the spirit found in our lives that sustains us on our masculine journey. To all men who wish to venture on this sacred path our circle is open. The centerpiece is a symbol of our relationship with self, each other, creation, the Earth, the Cosmos, and Mystery. The Jerusalem Cross has four equal arms that symbolize creative love spreading from the mythic city on a hill outward to all four corners of the Earth. Inspired by the Native American medicine wheel, it contains four points and intersecting paths symbolizing the seasons of the year, cardinal directions, human origins (red, yellow, black and white), and the four male archetypes (King, Warrior, Magician, Lover). The smooth stones symbolize the lunar months of the year. We use folktales from all over the world and many traditions to inform our sharing. Each man will hear the story differently depending on his own life experience. past or present. Sometimes our members will offer stories of their own creation. Occasionally poetry is used instead of a folktale. These may have been composed by members or obtained from published sources. The tradition of the Talking Stick empowers a man both to speak and be heard as he shares his own personal life experiences. Whoever holds the Talking Stick may draw upon the power of the stories contained within it to speak his own story from the depth of his feelings. In drumming we celebrate the discovery and awakening of a deeper masculine pride and spirit. The sound of our drums calls us together as men to reflect on our lives in an environment of trust, confidentiality and honesty. 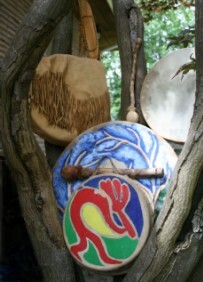 Drumming expresses both our grief over isolation and our celebration and joy as brothers on the planet. And found I had joined my brothers.Oh, God’s Joy! And where is a safe place where men share openly from their hearts without being judged, or advised, or fixed? And where is an honorable place where men listen with understanding to hear a man’s story, affirming him for his trust and honesty? Show me the whereabouts of such a place and I will be there. For that place is sacred and special; its blessing I seek.